When it comes to headlines, sugar has dominated the news in recent years. Just a decade or so ago everyone was focused on eliminating fats and eating only low-fat, skimmed or fat-free foods, however the nutritional paradigm has moved on and biological science has shown that actually excessive sugar can actually have a greater impact on our health. Our body’s ability to store dietary fat is limited so we actually eliminate excess fats from the food we eat quite quickly. Not the case with sugars which can play havoc with a number of metabolic processes such as blood-glucose control, our insulin response*, gut bacteria balance and weight gain (excessive sugar is converted and stored in fat cells, contributing to weight gain and obesity). Jamie Oliver has been campaigning tirelessly against childhood obesity, food labeling and advertising to kids. But kids aren’t the only ones over-consuming sugars and current statistics estimate that 26.2% of adults in England are obese and a further 35.2% are overweight (The Health Survey for England 2016). More recent results published by the NHS showed 617, 000 admissions in NHS hospitals had obesity as a factor (1). This is an increase of 18 per cent on 2015/16. Sugar Awareness Week 12-18 November 2018 takes place each year to focus on key strategies for reducing sugar and calorie consumption. 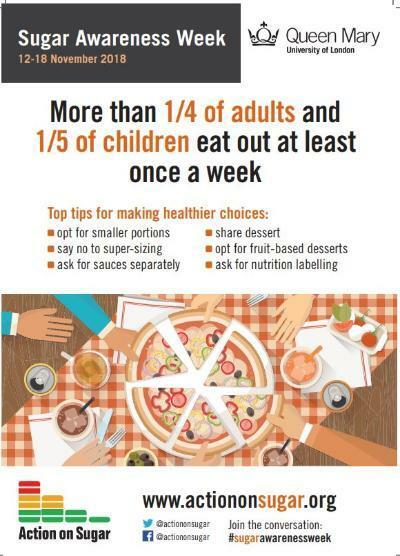 This years theme is around ‘Eating Out’ more healthily given the fact that 1/4 adults and 1/5 children eat out at least once a week (Download the poster here). The Action on sugar group wants to see better labeling when eating out so that consumers can make more informed food choices. They’ve recently called for a ban on so-called freak shakes served in restaurants and fast-food chains due to the dangerously high level of sugar contained in them. It’s easy to see how eating out can be tricky to really know what you’re eating but the challenge is just as present in home. Dr Rangan Chatterjee has jumped on the breakfast wagon following in Jamie Oliver’s footsteps to show how children in England are starting their days fuelled by more than half their recommended daily intake of sugar thanks to high sugar content in cereals. The stats are likely not dissimilar in adults with large caffè latte’s and croissants dominating breakfasts across the country. He has published his top 5 tips to help kids reduce their sugar intake. Jamie’s feature ‘What’s in the box’ first highlighted how some cereals contain as much as 35g of sugar per 100g (more than a third!) which is more than the 24g of sugar recommended per child per day. I was recently left shocked by how quickly sweets and treats can build up at home even if they are not part of your regular weekly shop. In just 2 months my two daughters bought home more than 5kg of sweets from a range of events, parties, birthdays, halloween and even from gymnastics! And that’s just sweets in the pure form, not including cakes, ice-creams and other treats they may be exposed to. My Nutritionist head was shocked but as a mother I can see how easily this happens. Unfortunately sweets have become the symbol for gifts, treats, for being good at school, for visiting grandparents and more. So how can we reverse this trend? Better food education is a must. We need to empower people young and old to make more informed choices about how to shop, cook and eat in general. The industrialisation of foods means that there is now more choice than ever before but not all foods are equal. We can all make small changes at home by opting for more wholefoods, fresh fruit and vegetables, quality protein and healthy fats and limit how many processed foods we buy containing sugars and harmful fats. Quantity also plays a part and portion-size is another area to observe to ensure we’re not over-eating foods or eating less nutritious foods too frequently after all a ‘treat’ is no longer a treat when its eaten every day. Click here for my healthy eating guidelines. Sugar Awareness week is a reminder to all of us to be mindful of just how much sugar we may be consuming on a regular basis and to take measures to reduce this for the benefit of our health. *The body releases insulin in response to eating to help balance blood glucose levels and transport glucose to our cells for energy. A high intake of sugars can imbalance this insulin response and lead to an over-production of insulin or increased sensitivity to insulin where the cells no longer accept glucose, so the glucose remains in the blood and pushes up blood-glucose levels dangerously high, which long term is a causal factor for Type II diabetes.